Renew Honda Cliq Insurance from Coverfox. Honda is one of the oldest automobile manufacturers in the world. 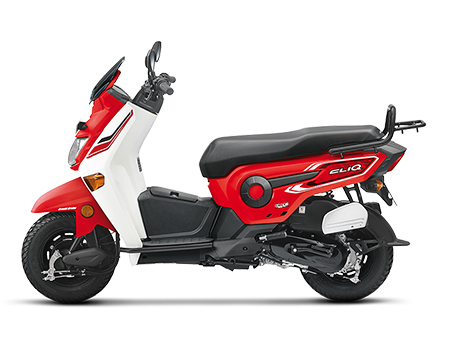 With their launch of Cliq, Honda focuses to provide more of a utility scooter in the market. When it comes to gearless two wheeler that gives you a comfortable long ride, Honda is the name that is synonyms in India. Honda Cliq is designed to provide utilitarian facility. Designed that utilized every inch to its maximum. Honda is colloquial with “comfortable and affordable bikes” in India. The sleek design of Cliq is spacious with front apron footboard, rear carrier space, under-seat carriage. The Cliq is one of the affordable and spacious scooters available on the market. Awarded as the “Scooter of the Year” by NDTV car and bike awards. The Honda Cliq has 110cc engine that enables one to go up to the maximum speed of 83Kmph and claims the mileage of 60Kmpl, Cliq is an overall package as a utilitarian scooter. With 110cc engine, Honda Cliq has good pick up and acceleration. One can easily ride up to 83 kmph. The exact specifications of the Honda Cliq are given below. The Honda Cliq comes with a 4 stroke SI engine and air cooling system. The maximum speed you can go up to 83kmph. You can save big on money, as it gives an average mileage of around 60kmpl. Renew your Honda Cliq insurance instantly. And receive the policy within 4 minutes. Even expired two wheeler insurance policy can be renewed without any inspection. All you have to do is provide few essential details about your Honda Cliq including the location of registration. The best part, these days you get to compare insurance policies from the top insurers on Coverfox.com's platform. Not just that, you can avail a number of discounts on your own damage premium. All this can be done on the go. Coverfox provides a complete support right from resolving your queries, purchasing the right policy to post-sales services to help you at the time of claims. Overall Honda Cliq is a utilitarian scooter. With it’s wider floorboard provides an ample of space in a scooter to store luggage. Moreover, it has a small storage bin under the rear seat with a mobile charging socket. In Honda Cliq, there’s an option to add an optional rear luggage rack. Cliq comes with a black tubeless tyres, so that you can ride without worrying about an unexpected deflation during puncture. With all these facilities, Cliq is an easy to handle but heavy duty utilitarian scooter that comes in four colour options – patriot red, black, morrocan blue, and orcus grey. What are the features of the Honda Cliq? What is the mileage of the Honda Cliq? Cliq has a mileage of 60kmpl. Why should you insure your Honda Cliq? Having a third party liability insurance is mandatory in India for all the vehicles plying on the road as per the Indian Motor Vehicles Act, 1988. However, a third party insurance does not cover own damage of the vehicle. To ensure any loss or damage incurred to your Honda Cliq, you need to opt for a comprehensive cover. A comprehensive cover ensures that you stay financially covered in case of loss or damage due to natural or man-made calamities including theft. If you want to your insurance company to pay the damage bills in case of an unfortunate accidents, you must opt go for a comprehensive insurance cover. How to make a claim on your Honda Cliq insurance? You need to contact your insurance company and intimate about the incident immediately. If you buy an insurance cover from Coverfox.com, we will help you at every step at the time of claims. You can directly take help of our claims assistance team. You need to support the claim with the legal and valid insurance policy along with the other necessary documents that may be required as per the case: third party liability, own damage, or theft.